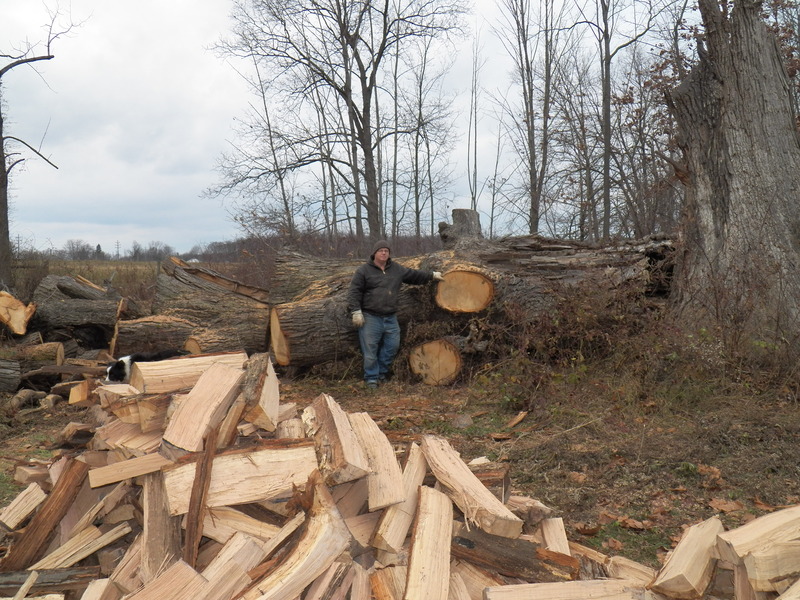 In my quest for wood, as many of you know, I am working on a large white oak tree that blew down a year ago. She landed in a sort of bad spot, crushing my fence when she fell. My time is getting short as winter looms, soon much of that tree will be frozen to the ground. The fact that I will get this wood out until the winter weather puts it on hold, has me scampering like a squirrel gathering acorns. I am cutting and splitting almost every day. The horses and I try to haul some every day too. I am using all three geldings. They, like me, are a little “soft” so having plenty of help allows us to work faster and longer. 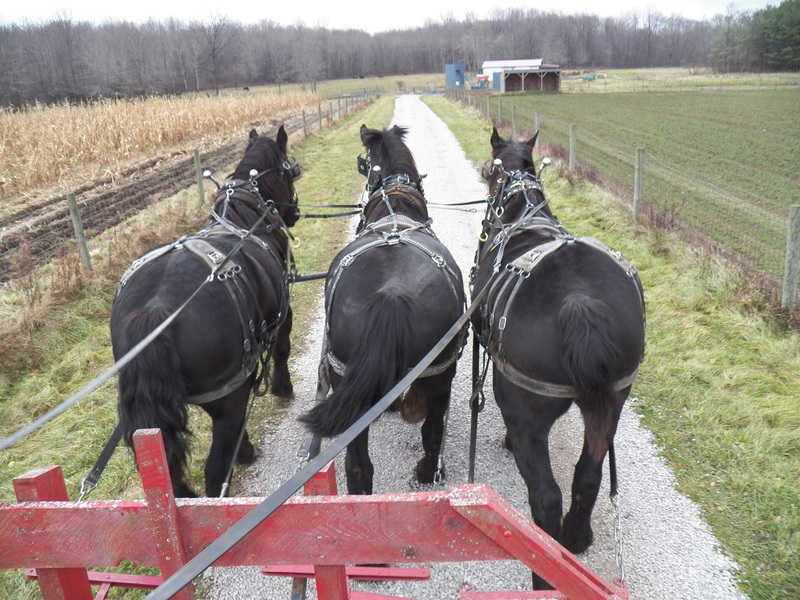 I like to show up with plenty of horsepower and believe me…three Percheron horses supply plenty of horsepower! The time it takes to get the third horse harnessed up, is nothing compared to the amount of work we can do. They stand while I hitch, load and unload, so, it’s as easy as 1,2,3!! 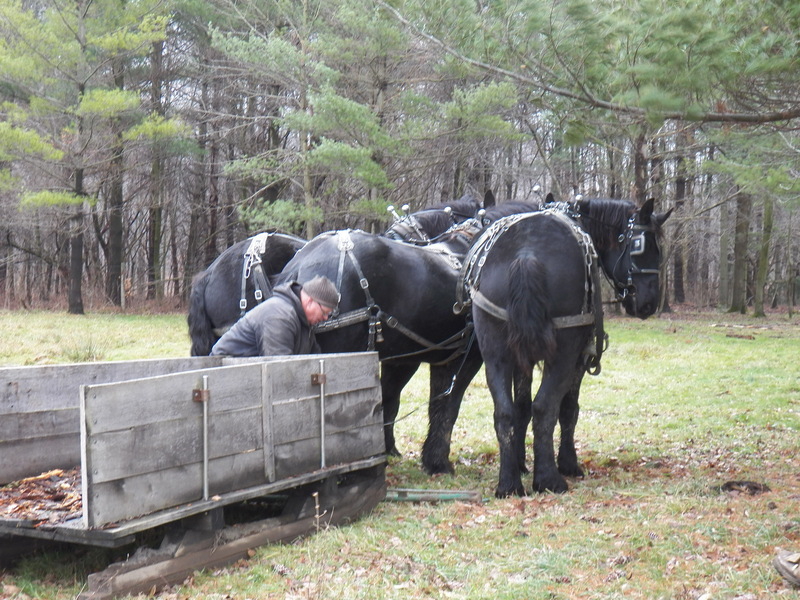 Today, the horses and I went for a load of sugarwood. My buddy and I have been cutting a large white oak that fell down a year ago. The tree was huge. The limbs are so large that I am having to block them in two foot pieces, split them into chunks, then finally, split the chunks into sugarwood pieces. The pieces I use for sugarwood are about four inches by four inches by two to three feet. My son Jake helped me load a load today. I didn’t unload it, cause I need something to do after work this week…. The tree project will take all winter perhaps more to get her all worked up using my days off that have decent weather. I can say for sure, it is a big job. The abundance in the old tree is remarkable. Even in her death, she is giving back to our farm…. It humbles me and fills my heart with gratitude. Jake and I tossed the wood chunks up onto the wagon. The horses stood quiet waiting for us to finish. I thought they might have a little trouble getting the wagon from the tree to the sugarhouse. I was wrong. The horses pulled that wagon like it was empty. The wheels cut in to the mud, but the horses paid it no mind. They are awesome and their power never fails to impress me. If I could speed this job up at all, it would be to have loaders and unloaders. I am thinking of the two-legged variety, perhaps two on each end. The job would go faster, jokes could fly like snowflakes and we could finally answer that age-old question…How much wood could a woodchuck chuck?